Election Day has come and gone, we now face a reality where Donald Trump is President of the United States. There are a lot of people out there who may have a difficult time coping with this. Luckily four states passed bills that will legalize the use of recreational marijuana. Unfortunately Arizona was not able to provide the country with a clean sweep, but four out of five is not too shabby. Let’s take a quick look at what we’ve got. Taking the reins on the East coast, Massachusetts has voted in favor of a bill to legalize the recreational use, possession, cultivation and sale of marijuana. The regulation falls in line with that of alcohol. The law allows those ages 21 and over to possess up to 1 ounce of marijuana when outside of their residence and while at home, 10 ounces. In order to properly regulate the bill, a three member Cannabis Control Commission will be setup with the initial appointment of members to be made by March 1st, 2017. And as far as the law itself, that goes into effect on December 15th, 2016. Massachusetts does not want to waste any time. 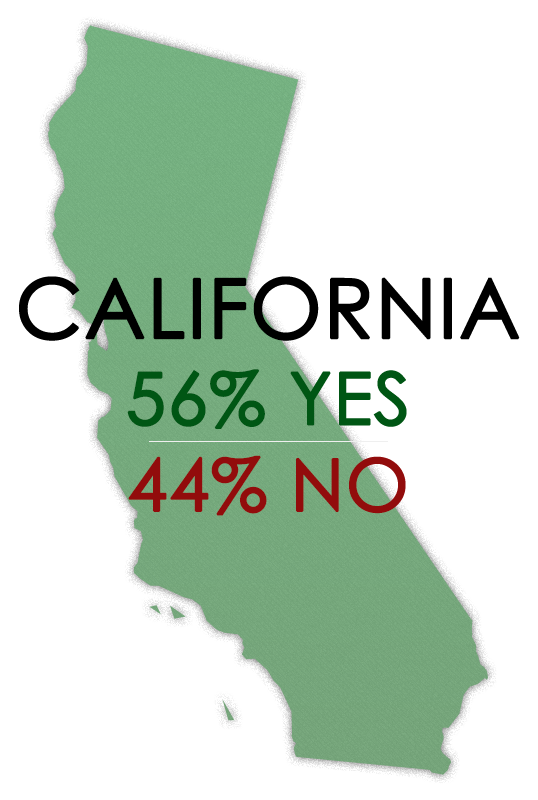 Rounding out the entire West coast (all the way up to Alaska), a proposition in California has passed to legalize the recreational use, possession, cultivation and sale of marijuana. 21 and up that is. For a state that made a groundbreaking move back in 1996 when they became the first to allow legal medical cannabis, the Golden State was surprisingly slow to fully accept recreational marijuana. The California based Proposition 19 failed in 2010 and then Colorado & Washington made history in 2012. First. Those in the world’s sixth largest economy will have to wait however as the legality change does not go into effect until January 1st, 2018. Fear, loathing and legal cannabis in Las Vegas. Following suite with their brethren to the West, Nevada has passed a bill to legalize the recreational use, possession, cultivation and sale of marijuana to those over the age of 21. For a political climate that has been shipping since 2008, it does not come has a huge surprise. However we are talking about a state that used to have some of the harshest penalties against cannabis in the United States. So looking even further back, this is a HUGE victory. Licenses for recreational sales will only be offered to already established medical marijuana dispensaries. And keeping in line with California, the law goes live on the first of January, 2018. 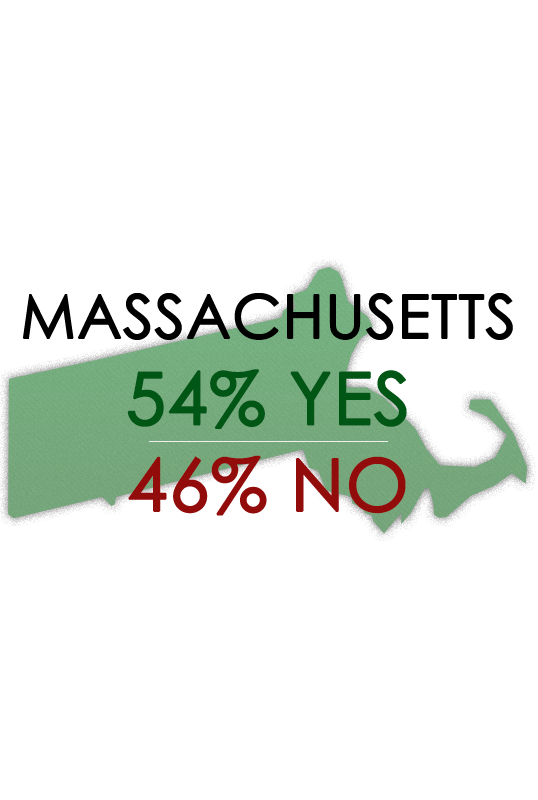 The jury is still out in Maine, but it is leaning slight in favor of yes at this time. Being optimistic, we are going to say it has passed (but our fingers remain crossed). Question 1, like the bills in the prior three states will legalize the use, possession, cultivation and sale of recreational marijuana for adults who are 21 and up. Despite many prior attempts at legalization, this is the closest that Maine has come to locking in a win. If the measure does pass, there will be a jump from zero to two legal states on the East coast. Plus this would put more pressure on the federal government to reschedule cannabis, which is the overall goal. Although there is obvious excitement for all of the wins, there was a single loss that marred a potentially perfect recreational marijuana election. Now batting a thousand isn’t an easy thing to do so we shouldn’t necessarily dwell too hard on the AZ loss. It was not a landslide by any means which shows that the state has an interest in legalization and perhaps that will not be for another two years or more, but the stage is set. 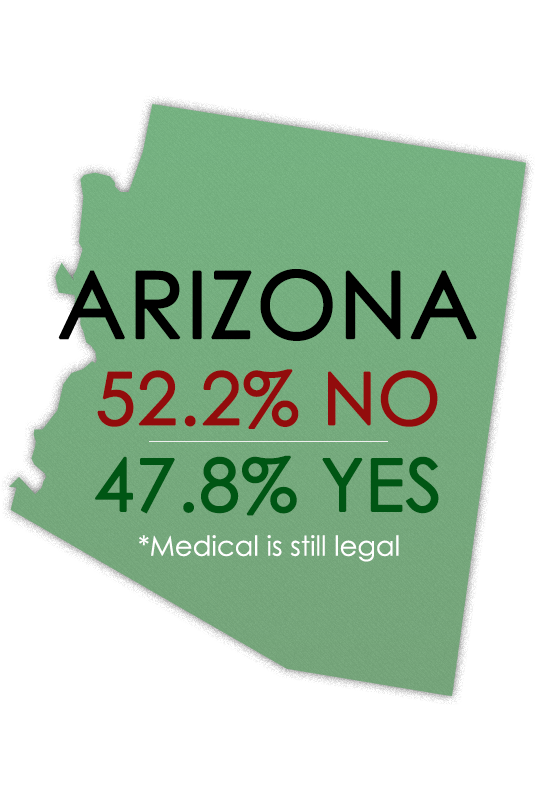 At least Arizona has a medical marijuana program that will continue on as is.